The Gemara (Avodah Zarah 19b) says that even the mundane talk of a Torah scholar requires study. As all hockers know, it is this scholarly mundane talk that is the most interesting. 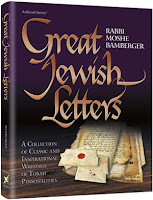 In a fascinating new work, Great Jewish Letters: A collection of Classic and Inspirational Writings of Torah Personalities, R. Moshe Bamberger, mashgiach ruchani of Landers College, collects over 120 letters from famous figures in the Torah world over the ages. The letters are arranged by topic (list below) and contain a brief introduction describing the author and the circumstances surrounding the letter. The relevant excerpt is then presented in English translation along with a sentence in the original Hebrew. The book is also adorned with beautiful pictures of famous people and places. Click here to read moreR. Bamberger has a keen eye for interesting letters. While he includes some obvious choices -- the Rambam's letter about converts, the Ramban's famous letter, ethical wills from a host of famous rabbis -- the majority of the letters are great finds that are not widely known. He has a letter from the town of Dvinsk to Jerusalem, protesting the offer of a rabbinic position to Dvinsk's rabbi, R. Meir Simcha HaKohen; a letter from R. Yitzchak Hutner to R. Moshe Sherer about the importance of effort regardless of the result; the Rema's introduction to his allegorical interpretation of the book of Esther; R. Akiva Eiger's letter to his sons about the importance of publishing his responsa on nice paper and with good ink; R. Avraham Grodzinki's letter after the Alter of Slabodka passed away in Israel;R. Yisrael of Shklov's letter about the earthquake in Israel in 1837; and much more. The authors are typically from the Lithuanian yeshiva world, although not exclusively. There are some letters from medieval Spanish scholars, R. Samson Raphael Hirsch, Chassidic rebbes, and a handful of women (although nothing from R. Joseph B. Soloveitchik, R. Menachem Schneerson or R. Avraham Kook). All-in-all, it is a great collection of fascinating letters. My only complaint -- which is pretty significant -- is that the book only presents brief excerpts from the letters. Often, the excerpt is one or two English paragraphs. That severely limits the use of the excerpt. I would have at least wanted the full letter to be published in small Hebrew letters at the back of the book, but they aren't (although there is a bibliography, which for obscure letters is of little use to anyone but the motivated researcher).